Free Shipping Included! Cable Management Boxes (3-Pack) w/ 20 Twist Ties and Cable Sleeve | TV and Under Desk Computer Cord Organizer Kit | Hide and Store Wires, Power Strips, USB Hubs by SafeCable at Tobby News. Hurry! Limited time offer. Offer valid only while supplies last. Keep your technology more organized with discrete, easy-to-use cable management boxes that easily hide away cords, power strips, hubs, and splitters. Keep your technology more organized with discrete, easy-to-use cable management boxes that easily hide away cords, power strips, hubs, and splitters. With each passing day our homes contain more and more technology, which means there are more and more cables, cords, and lines cluttering up our personal areas. That's why we created SafeCable Cable Management Boxes that let you quickly and easily hide cords, strips, and "eye sores", so you can keep your home and your life more organized and safer. Each set includes three different box sizes, 20 twist ties, and a bonus cable management sleeve that all work together to hide wires, keep them from being tripped over or pulled, and to make your home safer-especially if you have small children. Get this complete cable management kit today by clicking 'Add to Cart' above and keep wires, cords, and power plugs neatly organized and hidden away. ADVANCED CABLE MANAGEMENT - Every order comes with three versatile cable storage organizers to make it easier to hide power strips, cords, wires, USB hubs or splitters. VERSATILE BOX SIZES - Easy to use behind the TV, under your desk, or by a computer, these cable managers come in small, medium, and large to fit your personal space. Smart, Simple Design - Safecable cable storage boxes feature entry and exit slots and a snap-on lid to make it easier to hide messy wires and keep them safe discretely. Insulated, Impact-Resistant Protection - Each heavy-duty cable management box is crafted with a rugged plastic that's stronger and more durable for long-lasting use. 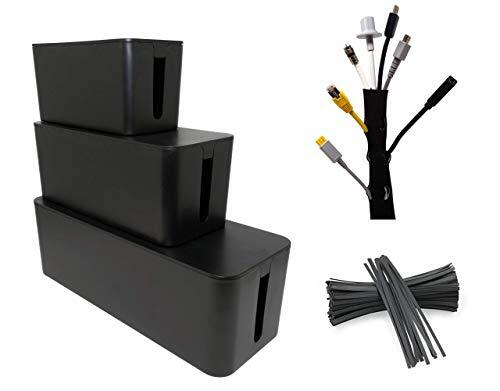 Essential Cable Management BONUSES - This set of cable management boxes also includes 20 reusable twist ties and free black cable sleeve for advanced organization. If you have any questions about this product by SafeCable, contact us by completing and submitting the form below. If you are looking for a specif part number, please include it with your message.